So, What does Heaven look like? Please note - I do not know the copyright on this image. If you, know, please get in touch so I can add it here. Please note again - I do not know the copyright on this image. If you, know, please get in touch so I can add it here. Please note - I do not know the copyright owner of this image, as the link no longer works. Maybe Heaven has Fields & Rolling Clouds? Please note - I do not know the copyright of the image, as the original is no longer active. The image copyright or source is located here. Image source/copyright link is no longer working. 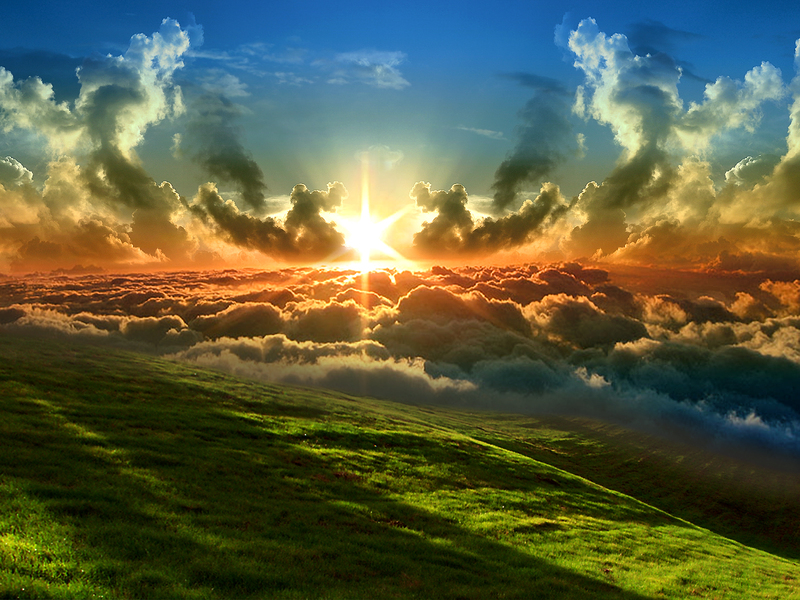 This blog post was posted on another one of my website entitled Truth by Design, which was also entitled “What does Heaven look like?” (published originally in 2009)! I have moved it over here onto this new site, Passion Fury now in 2017, and I have saved many of the original comments below for you to read. If you would like to add to the comments, please leave one in the comment section at the end of this post. Please note that none of these comments show the original link back to the author profile, as it would be too time-consuming to transfer (and it's been 8 years!). Thanks again. Quedula - Hi Andrew, Are you familiar with the works of the Victorian artist John Martin? Here is a link to “the Plains of Heaven”. Its an enormous painting one really needs to stand in front of it to get the full impact. Even I love it and I’m an atheist! He has also done an equally impressive “Last Judgement” and others biblical themes. Check them out. Susan - Breathtakingly beautiful!!! Jesus was a carpenter on earth, so it does not surprise me that heaven will be spectacular. The art is so captivating and the colors are so intensely vivid with life. Thank-you for sharing! Peaches Loves Jesus - I cant wait to get there. plain and simple. Now, i am not going to off myself, but don't you know how people say, “He woke me up this morning….” Well, if he decides to take a sis on a trip with HIM, then….I think i’ll live…. W. Rogers - This is very significant to me and brought tears to my eyes. My beloved wife went to the Lord December 18th, 2009. These illustrations are so beautiful, and what I would imagine Heaven to look like. I long to be there with her and Jesus. Thanks for putting these on the web. Tehani - I’m scared on how I’m gonna die but living in the afterlife going home to my lord and savior I can’t wait everything will be so much better than this world, this world has to much violence people act like they don’t care for one another the earth is nasty. Heaven will be beautiful and filled with so much love. Death is just the beginning. JesusFreak - I love the pics, and i cannot wait until the lord comes back! as a normal christian i have done wrong, and i have repented.. but the only thing i am worried about is me controlling my anger problems. but i am learning to controll it. as a 13 year old i love the Lord with all my heart. I have felt the Lord when i was in disbelief back when i was young, and now God is showing me dreams like what he did to Abraham and most of the powerful bible characters. my name is Elijah and if u could just send an email that will be greatly appreciated! Seante - a dear sweet friend who has definitely inspired me in following Christ, passed recently. We only got updates from her daughter when she was dying in the hospital. But a few days prior to her death she talked about seeing heaven…the one thing that sticks out in my mind is that she stated that the grass was very green and beautiful. I saw this in one of the pics above. Simply amazing.I do believe. And have been very blessed because of it. Mark - Heaven. For me is a place of pure beauty, but most of all full of Love, joy and peace for all. Now that sounds like a place I want to be. By Gods grace. Christopher Escue - I am so obsessed with the beauty of Heaven. I have been reading all that you have written on how it looks to you from your thoughts. I too, am scared of how I will die. I don’t want to hurt when I die. I am terrified of car accidents and getting burned up in one. So I have googled death types. Everyday I think about how my family is rejoicing together and singing in perfect tune and harmony. Oh what joy each of my dead family members received when they walked up to the Lord and he said well done my child, enter in. I know my family well. I can see them shout and wave their arms back and forth when they run up to the family who has gone on before. And oh what joy it will be to have your very own mansion. Where the lion will lay with the lamb. Blind will see and the deaf will hear. My nannie saids cry for the living and laugh for the dead. One should not cry cause their loved one has died. You should cry because you can’t go with them at the moment. But oh how I will see them again, when they gather by the river to welcome me home. Claire - @ everyone who commented, my eyes just filled with tears knowing we will all meet in a beautiful place and that we all have the same vision , to honour God. Thanks everyone for your kind comments and opinions. Heaven is truly an amazing place, but the best part is that Christians will spend eternity there with the LORD Jesus, and never have to live with the stench of sin any more. Hallelujah! - I am hungry to be they to see Jesus my lord and GOD the most loveable father.and my angel Michael. Truly, some will partake of heavenly glory (Luke 12:32) but these are few and are going there for a particular purpose, then we have the great crowd, uncountable(John 10:16) number of people who will live forever on earth, where there will be no sickness, no pain, no death; the former things have passed away(Rev 21: 4). Wickedness will be eradicated, the opposer destroyed and God’s sovereignty vindicated. Janet - I lost my sister 12 years ago in a horrible car accident. It still feels like it was just yesterday. The only thing that has kept me going is knowing I will see her again some day. To me, heaven is to live in the literal presence of the Lord. Nothing negative can exist there. Any pain, or confusion, or even loneliness will all drop away as we rise to meet the King. For those of you who fear how you will die, no need. I believe that the Lord sends angels to help. When you are in a horrible accident your body is designed to shut out the pain and memory. If you are hurt bad enough, it will be a little like being transported on Star Trek (yes, I know fiction) The idea is that as one world fades away the real world of heaven which is much more real than anything we have here will come into focus. To be absent from the body is to be present with the Lord. it will be immediate. Everything on this earth is like being in an old poorly filmed video. The colors, the tastes, the smells the sounds, the emotional and spiritual fulfilment will be so vivid and more real than anything you have ever experienced. The happiest moment on earth will pale in comparison to each nano second you are in heaven. Every blade of grass, or flower will be so beautiful you will wonder how you can ever look at anything else. The overwhelming feelings of joy and peace will cause you to know instinctively that this is what you have always wanted and needed. My father preached the gospel for over 40 years. When cancer was clearly going to take him home to heaven, I asked him…. “pop, what do you think your mansion will be like?” He said “I hope it is a cabin by a trout pond.” The day before he died he was slipping in and out of a coma and as I got ready to leave, I leaned over and whispered in his ear “I love you Poppa” He opened his eyes and seeing my grief, he whispered “He is still on the throne.” What a gift to have him as a father. He died in November and that Christmas I wrote a poem called “He left so many things behind.” The first part I talked about how he was leaving us, his family, my mom, his rock collection, then I said “along with all the things he left, some make me want to sing. You see along with leaving us behind , he also left his pain, he left sickness, darkness grief and shame, yes he left all these things. They just fell away behind him has he rose to meet the King. The pain of seeing my sister lying broken in the car, couldn’t make the trip with him since it was just too far. Now his eyes see Jesus, the one he worshipped and adored. Full fellowship he’d sought so long has finally been restored. My sister Ruth was waiting there to greet him face to face. What a Christmas present for them both to finally again embrace. None of us really knows just when his chimes will ring. If you heard them call your name, would you rise to meet the King? You really have to listen to hear that still small voice, satan tries to drown it out because he knows it is your choice. Satan knows the time is drawing close, soon all of this will end. On that day before the Lord, his knees will finally bend. For those of you who don’t believe in heaven or want to blame God for all of the horrible things mankind has brought on himself, if we are wrong and there is no heaven, then we have lived a life filled with more peace even in the middle of horrible storms. If you are wrong however and there is a Lord who loves you and wants nothing more than to keep you from eternal suffering, remember it is your choice. I dare you to pray about it. Jesus said that if you look for me you will find me. Claire - Oh i have tears in my eyes just reading so many of the comments , especially Janet's testimony, i do believe that heaven is beyond any persons imagination, it is beyond beautiful, almost magical, there are fields and fields of colorful flowers, waterfalls so tall, fruit trees with fresh fruit all day long, no darkness , the list goes on, we all know that God is a God of beauty and whatever he touches becomes instantly beautiful,God is so merciful that after us disappointing him so much , he just will not let us perish, what a wonderful Lord we serve, i too have experienced a great deal of loss in my family, the latest person to pass is my aunt, whenever i thought of her i would feel pain and sorrow, but when i think of Jesus i feel so much joy, peace and comfort because i know this is what she is experiencing , she is now restored to her former beautiful self the way the Lord intended and so is the rest of my loved ones, Thank you Jesus for the mountain underneath our feet. Jennifer - This is our home. This is where we were created. This is where we are from. Ptrjess - Heaven is a place of inner peace…but many tried to get there at this very moment but many fail, there is a wide chasm that hard for us to pass caused by the SIN that we have done and ONLY JESUS CHRIST is our Way to get there..He has the key to the gates of Heaven.Just believe and accept him as your Savior and Lord and He will direct you to Eternity. Jenifer - many say heaven is in your mind its looks like what ever u picture in your mind i have trouble cause i don’t know how to picture it? Kiera - Hello these images are beautiful so you no 1 day the people in heaven will be floating in the air and we will come up with them and then the people who are going to hell will stay on earth and then jesus will step on earth open his hand and the ppl who are left on earth will all fall to hell and we ppl who are going to heaven and the ppl who was already inn heaven will come down and live our life over….SO DREAMY OH YEA WITH NO PROBLEMS! Ron - Just a few lines from a paper I’m writing in College Composition, enjoy. The brilliant radiance that stops the night, or imagine the gleaming warmth of daybreak just before the sun pierces through, here lies the flame of life. Being a witness, and feeling the warmth in a cool breeze, there is no pain in the presence of this eternal existence. I saw the barrier to heaven, already open, exposing a city on the horizon. This city sits solitary, and in its midst is a wall. This barrier was formed from precious crystals, with layers of red, yellow, and golden-brown. These semi-precious stones are translucent so that light is able to pass through them. These jasper walls radiate brilliant rays of dazzling color. To cross this threshold that surrounds this city are twelve large gates; the gates are twelve pearls, each separate gate being built from one solid pearl. At the gates stand twelve angels, each angel has a body, neither man nor woman. Transparent figures all robed in white, with their flowing hair and feathered wings which flow along the length of their bodies, shoulder to floor. Their hair is white like wool, as white as snow. Piercing colorless eye’s which by themselves show passion and strength. The shading of their white features is the same as their robes which covers their muscular frame. Each face of these twelve commands a majesty that the most gifted artist would find difficult to render. At every entrance an angel stands beneath a name, one name for twelve sons, and one son from the twelve tribes of Israel. Through this gate is eternity’s road, a road made from gold, and as pure and clear as glass. This is the New Jerusalem; a river will flow forever with the water of life, pure and clear, originating from the throne of God. Kaleb - I was searching on the yahoo engine with a key sentence “what heaven looks like” and have ended up with these beautiful pictures and inspiring comments. I do believe and have no doubt about the eternal life after the death. Praise the Lord!! The Holy Bible describes that the heaven’s beauty is beyond our description. It is great to see that people are even highly inspired by these pictures. But, remember that it is even more beautiful than what we see in the pictures. Hallelujah!! How awesome to live where Jesus lives!!! Where the Lord almighty lives….. with full of peace and joy… Hallelujah!!!!!!!!!!!!!!!!!!!!!!!!!!!!!! Peter Lim - Heaven is not only unique but a place only where true love exists. Lord Jesus, the holy sinless Son-of-God, our Saviour, is a doorman (not any doorman on planet earth) standing outside this ten-star hotel to welcome all sinners including me. To enter this heavenly gate, not only must be accept God’s salvation, we must confess and repent of all our sins and totally turn away from our sinful life, from darkness into his light, sounds simply but it takes a lot to act on it. Our earthly clock is ticking, may stop any time, so act now. GOD HELP US OR WE ARE ALL DOOMED. SATAN WILL NEVER POSSESS SINGLE SOUL, I PRAY. LORD WE LOVE YOU EVEN THOUGH AT TIMES WE REALLY STRUGGLE, GOODNIGHT FATHER GOD, LORD JESUS, HOLY SPIRIT AND ANGELS, OUR DIVINE BUDDIES! Michael - Thank you sir for posting these images. In a way they are inspiring to me. I am by no means a perfect person. I do believe Jesus paid the ultimate price in blood for our sins, and that if we trust and believe in him, and receive him as our savior, we can attain salvation. I know our time is coming very soon to stand before him. I have asked Jesus into my life, but I still sin. I want and need so badly to know him, but I know if I met him five minutes from now, I would not be worthy of his grace. I am trying so hard. How many times can a person ask for forgiveness before the holy spirit says “enough is enough?” I also read in scripture that people will be deceived and led astray. I haven’t chosen a religion on account of this. What if I take up a religion, and they are wrong? What if I don’t take up a faith and they turn out to be right? This scares me. Is it enough to believe and trust in him? I know I also have to live my life by his standards. I don’t want to go to hell, but I also don’t want to just have that relationship with him to keep from going. That is not right. I want that relationship with him because he is my ONLY true friend. I am worried because I keep on sinning. I want to be worthy of him. Any advice? I want to live right. Please respond soon. Tomorrow may not come, I just want to be ready. Thank you so much and god bless. Jackie - I just so happened to search ” what does heaven look like” and I came across this site. I have never claimed to know much about religion, or God for that matter, but I have always had a sense that there is something so powerful and wonderful that leads me through this world. I lost my father almost 10 years ago now (which feels like yesterday), and one of the things that brings me comfort is that HE BELIEVED AND KNEW that there was another world that waited for him. Knowing that, and seeing these breathtaking images, allows me to believe. Thank you for sharing these inspiring pictures!!! Sandra - Hello, I really love the work you do. My husband is an artist and dose a lot of painting for our church plays (backgrounds) before he was saved he wanted to try to work for a comic company. I guess I'm writing you because he still wants to do that but for a different reason to tell others through his art about his faith in Jesus Christ. where can he start? Eve - To Robin Murphy: Do you really think you could get away with it as you stand before God on judgement day ? If you can’t find it in your heart to change your mind, then you will spend eternity in forever lasting fire, where you will wish to have a cool drink to cool your tongue. There is only heaven or hell after death, you decide where you want to be now, it’s up to you and no one can decide that for you. Please search for your self and find the answer, as Jesus does not wish for any to parish, he will forgive you and still welcome you in to his kingdom.,if you ask him to forgive you. Eve - There is really no excuse that you did not know him “Jesus” as I’m sure all here in the USA has for years and years that Jesus is coming and for all who accept him as Lord of their life will be saved, just as it was in the days of NOAH so shall it be again but this time without water. Yes for years and years the people then must have said to Noah “Your a crazy old man for thinking it will rain for 40 days and nights! And we not get into your boat filled with dirty beast, and we will take our chances and climb up high in the mountains, so don’t bother to have room for me in your boat! And now we say the same “We have heard this for years that Jesus is coming and yet he has not come, so no hurry we will have a chance if he does. We will not dwell on this so much and because we do good we wont worry about being saved, he will save the good people on the earth! No-one knows when he is coming, only God the father knows that, even so too we don’t know when we will die? So it is best to keep Jesus in your heart always and while your here show others Christ within you in all you do, so others may want him too in their hearts, to all live with him forever in this beautiful city in heaven, it is real. He said: “Where I am there you may be also” I go to prepare a place for you. Pray, then read the Bible and Jesus will let his self be known to you and you will find your treasures in heaven, where no man can steal, and rust can destroy, when you accept Jesus it’s like having a ticket to heaven where no one can take it from you. Salvador - The very top picture of Jesus standing between the lions in front of the golden city is my very favorite. To me, it is a very spiritual and awe-inspiring picture. It is my very favorite. Vern - The place in the pictures look great isn’t it? Well, personally I believe that Heaven a FAR FAR BETTER than those depicted in the pictures. I believe that what we humankind imagine is but a fraction of the glory of the Real thing. I think we are all up to a beautiful surprise. Let us all look forward to it. Selena - GOD is good! in so many ways! At times when i think about him, and i pray. I cry out of no where! he is amazing. I Love Jesus Christ and GOD - Heaven is a mystery to all of us here on Earth. I bet it’s too beautiful and peaceful to describe. It could be just light, it could be lush gardens, it could be anything really. God makes everything a mystery for us. We don’t just live on Earth for the sake of it. Before it’s our time to meet with God in the Heavens, we learn a lesson. Life is like a book, it could end good or very badly. But the thing is, most books don’t end until the lesson has been told… Praise the LORD for the life we have today and may the light shine on you all everyday. God bless. I really wish God could give us at least a sign to hint us what Heaven is like. But I guess not, for now, Heaven will remain a mystery for us people on Earth. Erin - I was laying in bed today, and started to remember a dream I had when i was about three years old. Though that was almost thirteen years ago, I still remember it like I had it last night. I remember walking through this beautiful little village, something between a Thomas Kingkad painting (my grandmother has them everywhere in her house) and a little Vermont town. The streets where cobblestone, but it was a beautiful stone, and there were flowers, and gardens and trees all around. There were little cottages and shops tucked among the gardens, and swings, and slides and sandboxes for children to play in, and benches to sit on everywhere. There were white, but weathered picket fences, and the grass was so green. But the thing i remember most was the people. Women shopping (or trading), hanging laundry, cooking and just talking. Men working on roofs, walking with their wives and dogs and children. And the children. They were running all over the place, laughing and playing games. Everyone was happy there, never complaining, living in complete happiness and joy and enjoying one another company. Through the whole dream the sun was like how it is on a summers evening, right before it sets. Everyone was just so happy and there was no sadness, or wrong. Vladimir - That was beautiful. You just gave me some strength and peace that I very much needed today. Thank you. Kasor - Excellent post at What does Heaven look like? | Heaven and Golden New Jerusalem. I was checking continuously this blog and I am impressed! Extremely useful info specially the last part 🙂 I care for such info a lot. I was looking for this certain information for a very long time. Thank you and good luck. Devin - My Nanny did just last year and it feels like it was just yesterday and then i seen these pictures and now i said she's in a wonder place. she is where she needs to be with some one who loves her the most. she's with God in haven where she needs to be. Vernon Brandon - I agree with you. Doesn’t really matter, we can speculate all we want to. I think we are so under mindful of the Lords thoughts and what He has in store for us. I just know that we will be completely satisfied. Olga Salins - Breathtakingly Beautiful, JESUS was a Carpenter, surely” HEAVEN ” is A SPECTACULAR place. Shayne - Heaven is a glorious place with no pain death suffering or tears it’s a beautiful eternal place where God almighty and the angels are the place every human should be and want to be after this life it’s beautiful beyond our imagination. Peggy Rickard - I am thinking of heaven a lot these days because I had a 16 year old son who died Jan 10th. I have to have something to help me hold on. This is the most crushing thing a Mother can go through. My child was saved and baptised a few years back. he died from a seizure. Jamie - How did you receive permission to use these pictures. I would love to receive permission to use the 3rd picture in an encouragement album I am making. Thanks! Naomi Hinshaw-Hersh - PRELUDE TO “MY VISION OF HEAVEN” After some friends of ours lost two of their little girls in a harvest accident one year, my daughter Hikke, who was only three at the time was already full of questions. My burden for the mother and father was so great I could hardly stand it as my own little one, so full of life, curiosity and questions, as children are at that age, tottered around in my shadow; her pink silky rabbit flung over her shoulder; bopping her behind. She pelted me with one after the other. “Mama, where is Heaven? Huh Mama?” My little daughter’s bright eyes were looking at me for immediate answers. “It’s a long way from here, my girl, in a beautiful place that God has built for us when we… do I say ‘die’? “Is that where they put you in the ground, Mama?” Already, at her age, we had been to several funerals where friends had lost babies at birth and one in a fatal car accident. “Oh now what, Lord? How do I explain THIS to my little girl, Lord, in such a way that she will understand, Lord?” I was beginning to sound like my daughter. “Oh, I was just talking to Jesus, my baby.” I groped, as full of questions as she was. “Lord!” I implored. I was beginning to sound like my little girl. Then I felt His loving presence quiet my anxious spirit and that’s when the answers began to flow from my mouth as I answered her questions one by one in such a way that she was satisfied, even happy for the little girls! And that’s when my eyes were opened. He gave me a glimpse of Heaven, full of children; not just adults and old people—and as I began to write I could hardly keep up with my pen. I was given this vision, not of an old folk’s home in the sky but the direct opposite and what I saw convinced me that it just wouldn’t be Heaven if children weren’t there. I am as sure as I am sitting here of what I saw and for whatever reason I was granted this scene, it wasn’t going to go unspoken, not if it can comfort one broken heart or give one grieving heart a moment’s peace of mind during this kind of loss. Little did I know that two years later some friends of ours would lose their little girl to a gruesome murderer who would beat her to death in the face with a tire iron, brutalize her and toss her into a ravine like a piece of litter. I was so glad I had written this down, for their sakes. Unknown Author Comment - While our hearts are breaking for you at this time of sorrow and our minds are screaming, “Why…? Why…? Why…?” I want to share something with you; a vision I had of children in Heaven, and if God should ever choose to take one or some of my babes home ahead of me, I beg you, be so kind as to remind me of this. Comfort me with these words. Rosy cheeked toddlers who, in this life, were born with congenital defects caused during conception or whose lives were snuffed out by whatever means, are scampering through fields of flowers, flowers that have never been blemished by pesticides, bugs or deformities caused by some quirk of nature or during the process of their unfolding. When stepped on, they spring back to their full beauty. When picked, they never fade or wither and their fragrances blend to far surpass the scent of the sweetest lily here on Earth. Youngsters who were taken from this life by some cruel means, whether by disease or at the hand of a sadist, it doesn’t matter, are building miniature mansions of, and sifting through their fingers, sand of the purest mixture, from the finest gems, with no thought of “bath time” or worry about “tracking it in”. Getting yelled at doesn’t even occur to them. It’s unheard of. Children of all ages again, are diving into crystal pools and never touch bottom, to resurface whenever they wish, with no fear of drowning. It’s comical to watch them and I suddenly realize, I’m grinning! The little fellow who in “life” suffered from asthma attacks and spent most of his life attached to an oxygen bottle or in the hospital, is running effortlessly and unrestrained with the “best” of them. He has no clue what it is to be “out of breath.” Suddenly there is a loud commotion and I see all of the children, from the tiniest toddler to the oldest teenager waving their hands wildly in the air and flocking in one direction, some leaping high into the air and bounding with Olympian strides while the little tikes are giddy giddy giddying along as fast as their little feet can fly! Many of them are bouncing along, light as balloons, laughing and giggling at the tops of their voices. ALL of their faces register exquisite delight with incredibly happy smiles on every single one of them! In the middle of the commotion, I notice that of all the children there, no one is crying. Of course! He has wiped away their tears. Eric Clapton had it all wrong. There are no tears in Heaven. There is no pushing, no shoving or name calling. Then it occurs to me that there is no concept of rudeness. Unkind words are virtually non-existent. There is no reason to push or shove nor is there a purpose for it. Why would there be? There is no hatred, anger, selfishness, cruelty or mistreatment of any kind. There is nothing but pure unadulterated love, peace and joy that we only THOUGHT we had known in this life. Dumbstruck, I survey the scene that is unfolding before me. I look up to see the image of a man, not too far off in the distance, walking along the twisting, winding stream that leads up to the pool beneath the waterfalls where the children had all just been playing. It too, seems to be laughing and dancing as merrily as the children and I can’t help but smile. Whoever it is, doesn’t appear to be in any hurry. His demeanour has a calming effect on my spirit inside. I am completely relaxed in the midst of all the excitement as they all clamor to HIM, each more animated than the next. Try as I might to get a better look at who it is coming, my mortal feet and legs fail me. They aren’t equipped to carry me as fluidly as the children’s celestial ones. I might as well have sandbags on mine. From the corner of my eye, I see a couple of men approaching as if to shepherd all of the children off in another direction and then I hear Him say in the most incredible voice! “It’s alright. Let them be. Let the children come to me.” And in that instant I know who that voice belongs to! “Jesus! Jesus! Jesus!” Every child in there is screaming His name, deliriously! They’re all scrambling to get closer to Him and it’s in that exact moment, that the very mention of His name renders me immobile. A dumb mute, I feel my legs give way beneath me and I drop helplessly to my knees in absolute surrender. I so desperately want to rush up to greet Him but I can’t move! It’s like I’m paralysed and no one even knows I’m there. Within moments, He is standing in the midst of them; toothless five year olds, freckle faced redheads, adolescent boys with peach fuzz on their chins, young ladies—Wait. Didn’t she used to be crippled? In my momentary paralysis, I felt what it was like to have polio. You name it, they are there, and there He is, like He doesn’t even see me. He is in His element, surrounded on all sides by His favoured above all, the children. The expression on His countenance in that moment, revealed to me what unconditional love looks like; something that to this day, I have never seen in my entire life. Yet it’s written all over His kind, gentle face. I have never, in all my life, seen such a sight or anything that remotely compared, anywhere, as what I am witnessing. What I see in His and the children’s eyes as He gazes adoringly at them is truly something to behold. Then, while I am still trying to absorb it all, a glimpse of Heaven without children flashes before me and it is almost more than I can take. I don’t even want to imagine it! Our minds cannot grasp the concept of “boundless joy” because joy and happiness as we know it, always seems to be overshadowed by something, however minute or magnanimous. For some, more than others, it hangs, ever present, like a condescending cloud of doom. His voice is so tender, like no voice I have ever heard and the child, who was once deaf, hangs on His every word. He’s in no hurry to go anywhere. There are no schedules to keep, deadlines to meet, places to go or things calling anyone away for His father’s plan has been fulfilled. There are no urgencies or time elements for there is no measure of time. He has them all eating out of His hand as He shows them one neat trick after another, that He can do with REAL flowers, REAL rabbits and REAL pigeons. Every face is focused spellbound on Jesus while He entertains them for ages, performing as if by magic—only HIS is real! I notice one little straggler trying to see what’s going on and I try to lift him up so he can get a better view but I still can’t move. Then before I know what’s happening, Jesus stretches out His hand and the little guy floats towards Him and into His open arms, a huge grin on the little guy’s face, while the children all burst into applause. How each of them left this earth is as remote to them as their natural births, no matter how gruesome or disturbing. Their joy knows no bounds. There are no shadows or clouds to darken their days, no fear in the night. There is no fear. There is no night. There is no need for sleep or nap-time. There is no need. It’s everything a child could dream of and beyond; way beyond! I look around to my right and see grown-ups standing there, joyfully taking it all in, and showing no favouritism or partiality towards their own. We believe and know that we will meet again yet that doesn’t fill the emptiness in our aching hearts. Sometimes, it seems the pain is almost more than we can bear and we die a million deaths yet we still cannot conceive what God’s purpose is or can we? That scene of Jesus and the children would not be! Yet He said in His own words, “Of such is the kingdom of Heaven.” Unless we become like one of these little ones, we CANNOT enter into its gates. We have been taught that God’s way is perfect but that eludes us. It’s beyond our mortal comprehension. None of us have ever seen perfection; NOT EVEN CLOSE. We say, “this is a perfect rose” as we admire its beauty, yet upon closer observation, we see where a thorn has torn, ever-so-slightly, one of it’s under petals or something even less noticeable to the naked eye. Your little ones are perfect now; unmarried, unscarred. Regardless of how they left us and hard as it is to conceive, now they have no torn under petals. They have sprung back to their full beauty and everything about them is ABSOLUTE perfection. Dream of this dear ones. Draw strength from this hope and consolation, while we around you, lift you up on wings of prayer. Naomi Hinshaw-Hersh - NOTE: I have not put a copyright on this piece. It is freely given to all those who have suffered the loss of a child, to copy and to pass on to others. All I ask is that you keep my name with it, not for pride’s sake but as a keepsake, if you will, of what God has given to me when I needed it the most. What God have created will not be destroy ! Only Man-made and all human made that are/were created will be destroy ! ! When our Lord Jesus come ,So that is your answer to your question about Earth. The Earth will be Wash n Clean but never Destroy because God is perfect on everything that were created.Read the Bible slowly and one version at a time. Christine - Yes, thank you for that beautiful description of heaven, and the comfort regarding pain and accidents. And for the time to share you beautiful thoughts. They comforted me as well. Elisa - I have been struggling with my husband’s death and missing him so much. I want to see him as I remember him when he was well before his illness. Will he be himself in Heaven? Will God forgive me for being an angry that my husband died, and being bitter and doing bitter things, and crying and screaming? I lost my faith because of his death. I’m scared, alone, worried; I want to be with God and also, with my husband. I’m living in the past, and need to know we will be together again with a new future in love as we were. Please reply here, somebody. I am grief-stricken. Randrianirina - On 1984, I had a dream about the New Jerusalem in Heaven. I arrived before a Golden Gate where 2 Angels welcomed me. We walked on a large golden road like glass. They showed me towers of the Holy City like shining crystals in a great high Wall, just like St John wrote in Revelation 21 : 9 – 12. Are you a Christian? Do you want to go to Haven and spend Eternity with Christi Jesus? Become a Christian Today! How do I become a Christian? Once you have asked all your questions, weighed all the evidence, and tested all the arguments, you will ultimately be confronted with the basic question Jesus... Read more on how to become a Christian.